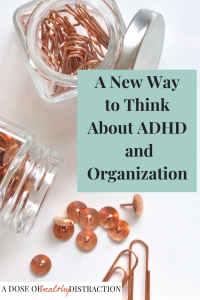 ADHD and organization – it’s a topic we can all relate to! Myself included. **This is a guest post from one of my favorite people, Jaclyn Paul! Jaclyn’s website ADHD Homestead was one of the first websites I found when I was trying to start A Dose of Healthy distraction. Her research and writing remains a constant inspiration to me. I hope you will check out her new book Order from Chaos. We all have that one area of our home that we’ve tried to organize so many times, and we’ve never succeeded. For me, this area often stirs up a ton of negative emotions — all of them directed inward. I’m supposed to know how to solve this. Why am I such a mess? I’ll never get my act together. I’m such a fraud. And on and on. But what does all this self-loathing get us? It certainly doesn’t help us succeed. When we let our emotional response to repeated failure take over, we shut out opportunities to actually solve the problem. And that’s all it is: a problem. And problems can usually be solved with a systematic approach. When an organizational system keeps failing, we need to change the system. We can’t very well change our brains! Neurotypical folks might be able to force themselves to use any old organizational strategy because, hey, it’s what you’ve gotta do. People with ADHD usually can’t do that. The way your brain processes information affects what kind of organizational system will work for you. If you try to work against your brain, your system will probably fail. How does your brain see and process the world? As part of my high school curriculum, I took a learning styles assessment. It provided my first big insight into learning and cognitive differences, and what these mean for us as individuals. What feels like a perfect solution for one person may not work at all for another. I share a home with my husband and son, both of whom possess very different brains than my own. This presents some challenges for us when it comes to staying organized. However, knowledge is power. I try to remain sensitive to our differences and structure our household accordingly. Auditory folks learn by hearing and listening. They store information based on the way it sounds, and often find themselves reading out loud to understand a passage of text more completely. When an auditory learner begins to fidget, she often hums or talks to herself or others. Seeing something isn’t sufficient to internalize it. An auditory learner needs to hear it, too. By contrast, visual learners can easily visualize what they’re learning. They like to see pictures. Spoken instructions can be challenging, and a visual learner may be especially distracted by sounds. They’re drawn to color, and to concepts and stories that are rich in imagery. A tactile learner takes in the world by touching and doing. These are the hands-on people who love to move, build, and draw. They struggle to sit still and require frequent breaks. You may be able to spot a tactile person by the way he gestures and talks with his hands. Computers can reinforce learning for tactile learners by engaging their sense of touch. If you’re curious about your learning style, you can take a short quiz on the PSHEAA website: http://bit.ly/PSHEAAlearningstyles. What does this have to do with staying organized? Our learning styles tell us something unique about our brains. When I took the PSHEAA online questionnaire, it told me I’m 60 percent auditory, 30 percent tactile, and 10 percent visual. Meanwhile, my husband’s revealed he is 20 percent auditory, 40 percent tactile, and 40 percent visual. Our brains see the world very differently. And yet, despite these different needs, he and I need to cooperate to maintain order in our house. For example, I love to be thrifty and I will reuse file folders until they fall apart. It doesn’t matter if they’re a big mix of manila, red, green, blue, and purple. To me, they’re all file folders, and all labeled with their contents. They all feel the same as I run my hand over them. For my husband, the colors have to mean something. A file cabinet with folders that are all different colors for no reason isn’t just annoying for him. He actually won’t — he’ll say can’t — use it. This was something I had to learn and adapt to. If you’re living with another human, you need to understand how their brain works and how you might be sabotaging their efforts to help you. Even if you’re only living with yourself, you need to know your brain and what it needs. Visual thinkers will respond well to color coding, whereas auditory thinkers probably won’t care. I organize my reference books in such a way that I can run my fingers over their alphabetized spines to find the right one (a tactile experience I cannot replicate with an eBook). An auditory person may be motivated by music or conversation during tedious organizing tasks, whereas tactile folks will need to get up from time to time and move their bodies. Extraneous sound may drive a visual thinker crazy when he’s trying to concentrate. In other words, the environment you create for yourself and the tools you choose to help you stay organized can make or break your chances at success. As a person with ADHD, you should be especially sensitive to the conditions that help your brain function at its best — and the types of distractions that will derail you the most. Don’t try to power through a situation that isn’t optimized for your brain. An organizational system built on tools you find unappealing or distracting won’t succeed. Surround yourself with the most helpful tools and systems for your unique brain and you’ll spend more energy maintaining order and calm in your life — and less trying to force a square peg into a round hole. Looking for more ADHD experts and online resources? Sign up for my mailing list, I don’t send junk.